Weight is the enemy in reciprocating components. All ORCA pistons are much lighter than competitive pistons because we use forging dies especially designed for the 113" 4" bore and the 132" 4 3/8" bore. Dome thicknesses are held to a minimum and wall thicknesses are perfect for the bore size. Ring packages are lightweight with tight ring grooves to maintain ring geometry. Forged with high strength, low expansion alloys, these pistons are set up "tight" with their cam ground contours and are quiet in operation. There is a big difference between static and dynamic compression ratios and camshafts have to be taken into account when we design pistons. It is the dynamic compression ratio that you should be concerned with. Unless you plan the piston design to work with the cams you will end up with something unexpected. Check out our RSR Advanced Dynamic Compression Ratio Calculator to see how camshafts and static compression ratios intersect. ORCA pistons are hand finished to remove any sharp edges and also to put in special features for the intended usage. The above pictured pistons are ready to enter the final finishing stage for a normally aspirated 135 hp ORCA. These 113" pistons have been machined to a gasketless deck height of .035" and have a dome volume of 15.75 cc's, which yields a static compression of 11.54:1 with the S&S Special Application Heads which have been final machined to a volume of 96.4 cc's. Check our RSR Static Compression Calculator for your own combination. The dynamic compression is a different matter...check out our RSR Advanced Dynamic Compression Calculator to see how this is a good set-up for the street. These 113" 4" pistons are lighter than stock components! 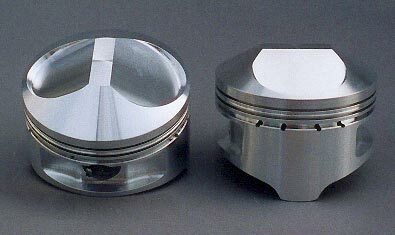 The bare pistons weigh 420 grams. The rings weigh 38 grams. The .892" S&S tapered wrist pins weigh 109 grams. Less weight means faster acceleration and less strain on your bearing surfaces. We call these pistons "Active" for several reasons: First, you may have noticed that they have dimples on the dome area (no comment); and Secondly, because they have a minimal dome surface area and a large squish band that mates with the SA heads. Keeping the combustion space small and centralized around the unshrouded valves is important for a quick burn. Unlike "hemi" or bathtub designs, this piston and cylinder head combination is designed for high swirl, with the mixture directed to the exhaust valve area. The pistons pictured above are for a 350hp 113" ORCA Pro Street Turbo. There is no bathtub, just unshrouded valves and a large squish area to provide a small "chamber" that is far less sensitive to detonation. 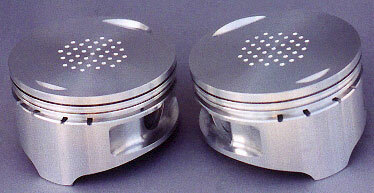 They are "salt shakers" if you have Bonneville in mind. Static Compression Ratio is 9.9:1. Don't try this on a non-ORCA motor because anything else will detonate and destroy your engine. No, we aren't going to tell you what the dimples are or what they do. Come back again and we may spill the beans...Then we'll show you some real secrets. ORCA piston rings employ the latest technology in ring design. Lightweight, thin, rings with low tension and precise oil control. Three rings per piston: the top ring to control gas flow into the second ring land chamber; the second ring for oil control; and the third ring, a three piece oil ring, to remove excess oil from the cylinder walls. 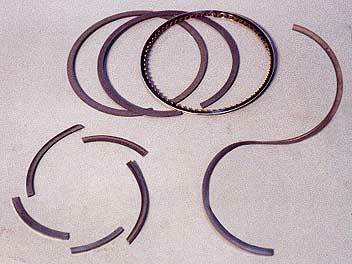 Top rings are ductile iron and can take some serious abuse without fracturing. The ORCA top ring pictured above is twisted into an "S" shape without breaking. Stock rings, or lesser quality "bargain" rings can be easily broken like the five segments pictured at the lower left of the photo. When the rings break under detonation they gouge your cylinder wall and dump oil into the combustion chamber, further lowering the octane and causing even more destructive detonation. ORCA Top Rings are moly coated ductile iron and the Second Rings are zinc phosphate coated ductile iron for lower friction. The lightweight three piece lower oil ring uses a stainless steel expander center segment with two very narrow chrome plated "rails" that more precisely hold their geometry than do cheaper rings and therefore offer superior oil control. Piston rings can account for 20 to 30 percent of an engine's friction and friction robs horsepower. Rings are often an afterthought with little attention paid to either ring tension, weight, land geometry or surface finish of the bore...RB Racing takes ring design very seriously and employs the latest ring technology, just like they do in NASCAR. All ORCA cylinders are finished to 4-6 microfinish for long ring life and better ring sealing.